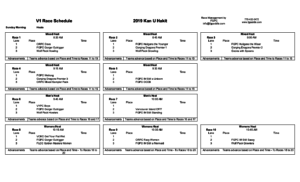 Welcome to the 19th Annual Kan-U-Hakit Outrigger Sprints! Click on images below for larger, printable copies. 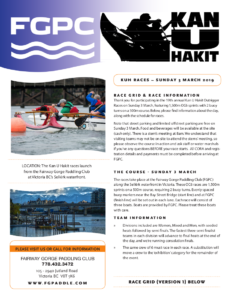 This race takes place at the Fairway Gorge Paddling Club (FGPC) along the Selkirk waterfront in Victoria. This OC6 race is a 1,500m sprint on a 500m course, requiring 2 buoy turns. Evenly spaced buoy markers near the Bay Street Bridge (start line) and at the FGPC (finish line) will be set out in each lane. Each race will consist of two or three boats. Divisions included are Women, Mixed and Men, with seeded heats followed by semi finals. The fastest three semi finalist teams in each category will advance to the final heats at the end of the day. The same crew of 6 must race in each race. A substitution will move a crew to the ‘exhibition’ category for the remainder of the event. All teams must check in with the boathouse office before 8:30 am on race day, and confirm are current CORA members. Race Schedule: Race start at 8:30 am, registration open at 7:30 am, steers meeting at 8.00 am. Teams will be registered on a first come, first served basis; Fee is $120 including tax ($20 per paddler). Please complete and submit the registration below and submit payment no later than Wednesday February 20, 2019. If registration fills before the Wednesday, February 20, 2019 your crew will be waitlisted. In addition to completing this registration agreement, the Team Captain/Manager must ensure that all paddlers have completed an online individual FGPC waiver for the current season and renew their CORA memberships. There will be 25% administrative fee for all withdrawals. The final date to withdraw a team from the event is February 20, 2019. There will be no refunds of any type after this date, including if the event is cancelled due to safety reasons. If you have any questions or concerns about this registration process, we’ll be happy to walk you through it — send us an email at info@fgpaddle.com and we’ll get in touch with you!